Driving visibility, growth and mentorship through facilitated connections and targeted resources. An invitation-only network of early-stage startup founders and corporate executive mentors, powered by the Sprint Accelerator and supported by several other corporations. The formalized mentoring program lasts 6 months (1-2 meetings/month between founders and their executive mentor). However, with each new cohort, the network grows and all prior participants come together for group mentoring and networking events, including a group “unconference” with mentors and an end-of-the-year celebration. Additionally, founders receive a detailed DiSC Work of Leaders report as well as training to better equip them as a leader. 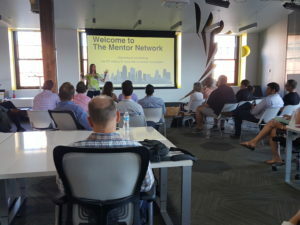 Applications for the 2019 Mentor Network are now open (Cohort 7 runs July – December)! APPLY HERE. Would you like to submit a theme for consideration? Please complete this form and we’ll be in touch as soon as possible! Every Wednesday 10am – 4:30pm spend the day with your extended network and meet some awesome new people working from our space for free. Develop additional knowledge through our content and speakers. Why? Because sometimes the most brilliant ideas come from diverse groups of curious and driven individuals. Get outside of your normal work environment and dive head first into the KC startup ecosystem! While open Coworking will be available nearly every Wednesday, check out our full calendar for content on those days! Startup founders, sign up for one-on-one time with an expert! We will host and feature professionals with a variety of expertise throughout the year to help you tackle the challenges around your growing venture.